Creme brulee is a timeless dessert. There’s nothing like a well baked brulee that is so smooth that it slides down your throat like slippery butter. I get excited when I tuck into a creme brulee. Tapping the sugar layer slowly in order to break it – that act in itself contains the anticipation of a eager woman (such as I) who simply cannot wait to taste sweet custard with vanilla beans. I love that sensation. You know, when both custard and vanilla intertwine and give you that sense of surreal calm as you taste it with your tongue. Mmmm…. But as much as I love eating creme brulee. Not all creme brulee can be eaten. Or at least, I bought an inedible creme brulee. No, don’t be shocked. It is nothing serious really. By inedible, I don’t mean that I’ve tried an absolutely horrible creme brulee. Nah… I haven’t had the misfortune of facing such a disappointing encounter. Ta-dah! 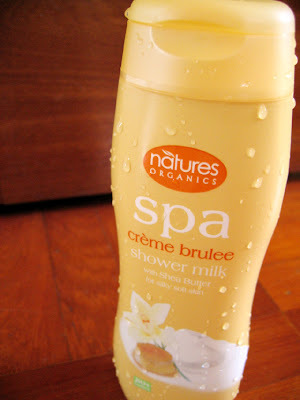 Nature’s Organics Spa Creme Brulee. Definitely not for those who hate smelling like dessert lest you end up attracting ants. Hmmm no ants have bitten me so I guess it’s safe. 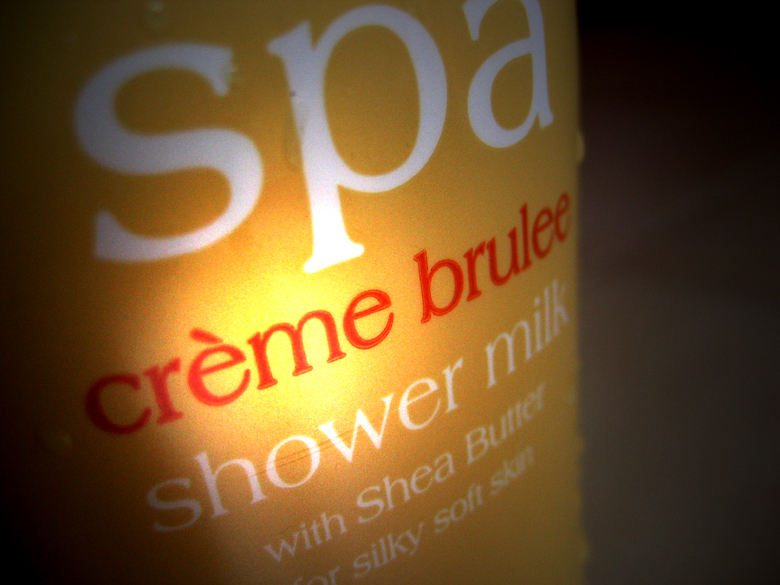 My new creme brulee shower milk is not only nice-smelling, it really wraps round my skin like milk. Very moisturising. I know this is a food blog and I’m starting to sound as if I’m a sales person selling shower milk – but really, this is good stuff. It’s creme brulee! 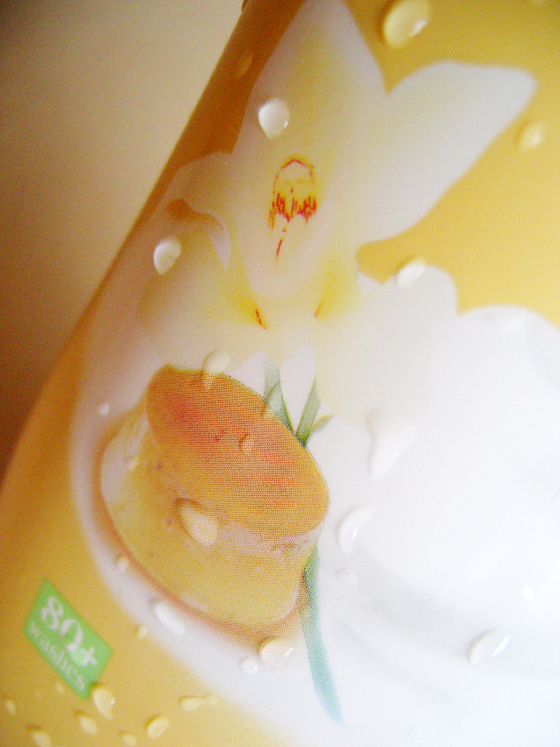 It has a tinge of vanilla fragrance together with a custard-y scent. This is gorgeous. Contains shea butter too. Not quite my kind of thing, but you’ve to give whoever came up with the idea of dessert-smelling shower milk credit for his creativity. I’m more than happy with my magnolia handcream, takes me right back to Bali every time i catch a whiff of it but i just have to find out how exactly your creme brulee shower milk smells. Any idea if it’s a permanent shelf item? I’ll only be back year end. pfft. Babe! I think I saw you on the bus today but becus its sooo earlya nd Im stuck at the back, i cud not sya hi to you! yr gorgeous and sooooo slim!! Gee, lucky girl!! Haha, I smell like papaya after using the Papaya Body Scrub from body shop. ^_^ and the smell really give me a good night sleep!